"I had to take action with my crew a decade ago to protect hundreds of sharks, and of course, those shark poachers have very powerful allies in government and other places," he said. The U.S.-based Sea Shepherd has denied wrongdoing in the Costa Rica case and urged supporters through its website and social media to write to German officials, arguing that the charges have less to do with law than with Watson’s anti-conservationist enemies and that it doubts he would get a fair trial. "It's very strange that this so-called extradition thing was dismissed by Interpol in every country except Germany," Watson said Monday. In the 2002 incident, Sea Shepherd ship operations officer Peter Hammarstedt said, the Ocean Warrior found the Costa Rican crew killing sharks for their fins in Guatemalan waters. It initially had permission from Guatemalan authorities to stop it and tow the vessel into port, he said. The Ocean Warrior used water cannons on the fishing vessel in an effort to stop it, but “there were no injuries and no physical damage to any ship,” Hammarstedt said. The Ocean Warrior succeeded in stopping the ship, but Guatemalan authorities eventually asked Watson to release it, Hammarstedt said. The confrontation is detailed in part of a 2007 documentary, “Sharkwater,” Hammarstedt said. Shark finning is the practice of cutting the fins off sharks and throwing the shark itself back into the sea, where they die. The fins are used for expensive soup, mostly in China. On Monday, Watson said he hoped he could use attention the case is generating to bring a new focus on preserving life in the world's oceans. "We have all the laws and regulations we need to protect our oceans, but we don't have governments with the guts to enforce those regulations," he said. A century from now, none of this will matter. Whales will most likely be extinct, as will a large number of other species. Justifiably, mankind may be in the top 10 of that short-list; considering all the ways we've tried to kill one another over the past several thousands of years, we're long overdue. And is that such a bad thing? 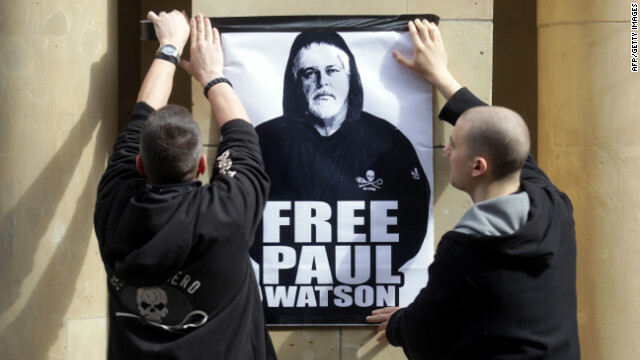 Paul Watson represents the best of what men of conscious want for our world. He does it against all odds and against Big Business which have unlimited funds, and don’t care about what damages may be done.. Keep in mind that the reality is that Big Business Money is what’s behind the people trying to stop PW. Paul Watson’s tactics may not always be the most politically correct, but it’s the only way Big Business understands (disrupting the cash flow). Big Business’s goal is to run the world and we all see this by simply following the news.. The world is in need of more people like PW. As far as the industries or in this case government looking for PW, well this is simply another, follow the money story..
Never have I witnessed a more inept group of do-gooders than this collective group. Who the hell donates to this group of losers? Millions of dollars of wasted money that could be effectively utilized for something other than this crap. Like most people I'm against hunting whales but the tactics of these buffoons is border- line terrorism. It does make for good TV even if they can't seem to save any whales. They can't even keep their equipment operational or lower a boat safely. It's only a matter of time before someone gets killed and the party is over. These sea shepards are the abortion clinic bombers of the sea. The activities they try to disrupt are legal, but they view their own values as more important than the law. GreenPeace was like those who held silent vigil outside the clinics, registering their dis-approval. Sea Shepard is the clinic bomber who comes in and says we will sink the ships, kill the doctors, and blow up the clinics. Who are you people? Thank God for folks like Paul Watson who take seriously the responsibility we, as man kind, to responsibly manage all God given resources. There is no reason to indiscriminately kill sentient creatures like the whale, and dolphin. I just wish I had the courage to do what he is doing. To know indiscriminate killing takes place and do nothing is wrong. The least we can do is to voice our support.